In Brief: Hike over Dragon Cloud Mountain and down through a small village, then walk out the along the most scenic part of the White River, crossing 4-5 times on the way to the end. A crossing on the White River. approx. 4 hours start to finish over 11km. Update: The river level is raised and we’re doing the Great Flood hike instead. Try a a fresh take on our White River hike that includes a hike up to a high point with views of the river far below. The northern end of the White River has become a popular destination, and with that has come new roads and more people. It’s not as wild and lovely as it used to be. But the last section remains nice and wild, and we think it’s the best part of the river hike. 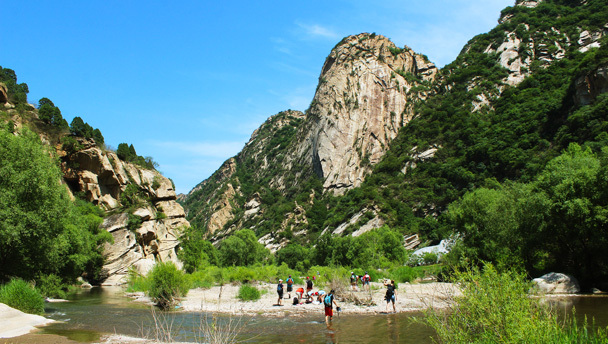 We also know that if we climb over Dragon Cloud Mountain we can skip the popular areas and start the river hike right where the scenery is nicest. Once upon a time, Dragon Cloud Mountain was one of the many scenic areas hidden away in Beijing’s mountains. Now, with the park entrance boarded up, the views of the surrounding cliffs, canyons, and boulders are more or less forgotten. But not by us! We follow the old path above the river to find the steps that lead up to the top of the mountain. The climb up to the top is fairly steep, but after a while – and maybe a few stops for rests – we’ll be up on top and enjoying the excellent views. Down below, we’ll see the White River, and in other directions all around we’ll see rocky crags and bluffs. On the other side of the mountain we’ll find a narrow concrete road that comes up from the Beijing side, and then down to a tiny and isolated village. We’ll follow the road down to the village and walk from there down to the river. The track from the village brings us down to the White River at a big bend, which is our landmark for the beginning of the wild part of the river. We’ll be hiking by the river for the last 4km of the hike. As we hike down the river we’ll see more impressive tall and steep cliffs made from massive slabs of rock and boulders, pine trees, grassy dried riverbeds, birds, and rocks reflected in pools of water. On the way to the end we’ll cross over 6-7 times, finishing back near Dragon Cloud Mountain. We recommend that you bring a pair of sport-type sandals to protect your feet from rocks during river crossings. It’s possible to cross barefoot, but the bottom of the river is rocky and a bit hard on the feet. If the sandals you wear don’t have straps to hold them to your feet, there’s a good chance you’ll lose them! The climb up to the reservoir and the haunted house is quite steep – perhaps tough if you’re not used to hiking. We’ll be walking on the narrow concrete road for about 3km, unless we can find a new shortcut.